When it comes to the task of creating an appealing wedding reception menu, you want wedding food ideas that aren't tired and predictable. Choosing the right options can be hard to do depending on the time of year, your setting/venue/theme, and your wedding budget. 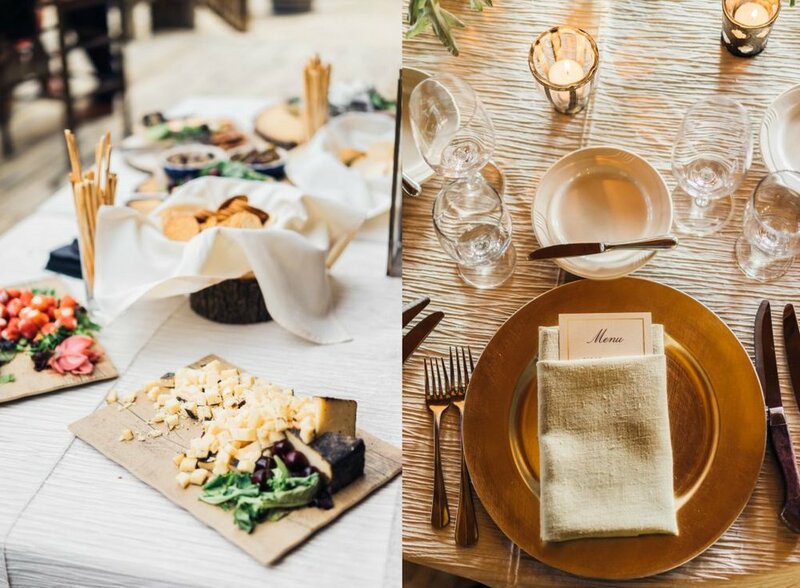 But your Denver wedding planner Blue Linden has come up with some great menu planning tips and wedding food ideas to satisfy your guests' appetites and make your wedding menu a point of pride! As with all things wedding, budgeting is the first thing to consider before nailing down exact wedding food ideas. Certain foods, such as chicken, pork, and pasta are going to run on the lower side in terms of cost. Sourcing local and opting for seasonal ingredients will also save a penny or two. Providing vegetarian dishes will not only satisfy your non-meat eating guests, but will also satisfy your budget. Instead of putting "choose: chicken, beef, or fish," on your RSVP cards, a budget-friendly choice is to make duo or trio plates the same for everyone (like a surf-and-turf for instance). You can always scrap the individualized servings and opt to go buffet or food-bar. And don't forget the booze - forego a full bar and offer a signature cocktail choice from both the bride and the groom, and an array of wine and beer. 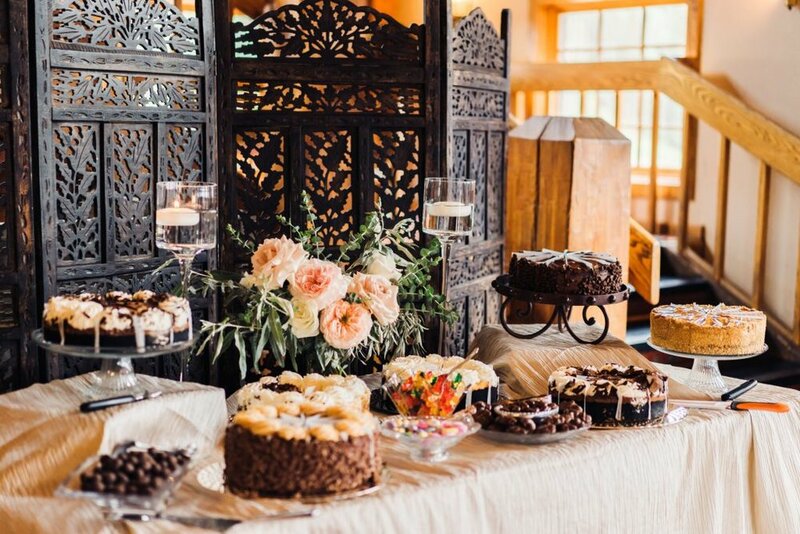 And when it comes to desserts, do just a cutting cake and provide a candy-bar or sweets station instead. Make sure to choose a caterer early, most experts say about a year in advance. And don't rule out a venue that provides a caterer: is that something that appeals to you? If not, make sure you find out if extra costs are incurred if you bring in your own. 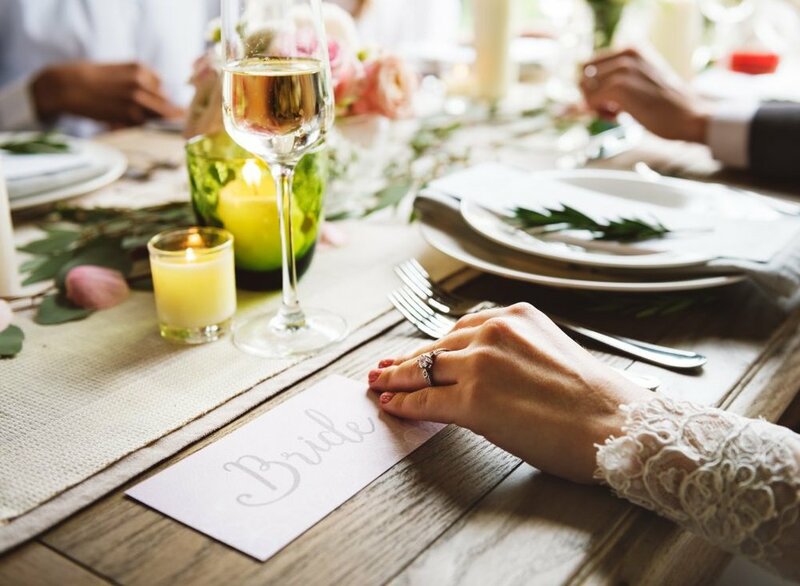 You'll need to provide your caterer with a rough estimate of the number of guests that will attend your reception; this will allow for a more accurate price quote. Number of guests will also help decide what types of foods are easiest to serve. For example, while you want made-to-order egg soufflés for 300 people, it just may not be possible given the time needed to pull them off. Additionally, your wedding food menu will need to take into account the kitchen and appliances available at your venue. 200 freshly seared beef filets is your dream protein, but your church's four-burner stovetop won't (easily) lend towards a successful service. Vegetarians? Vegans? Gluten-intolerant? Learn the dietary restrictions of your guests and provide a substantial amount. These dishes are just as tasty as the other items on your menu, so make sure to account for non-vegetarians eating these as well. Mix it up! Provide light starters and indulgent main courses. Make some items bite-sized and others that will give filling satisfaction. Have easy-to-eat cocktail snacks and sit-down, knife-and-fork options. Hot? Cold? Both? Again, take your venue's appliances and storage/cook space into account when deciding on hot food, cold food, or a pleasant mix of both. Decide on the style of wedding you want. 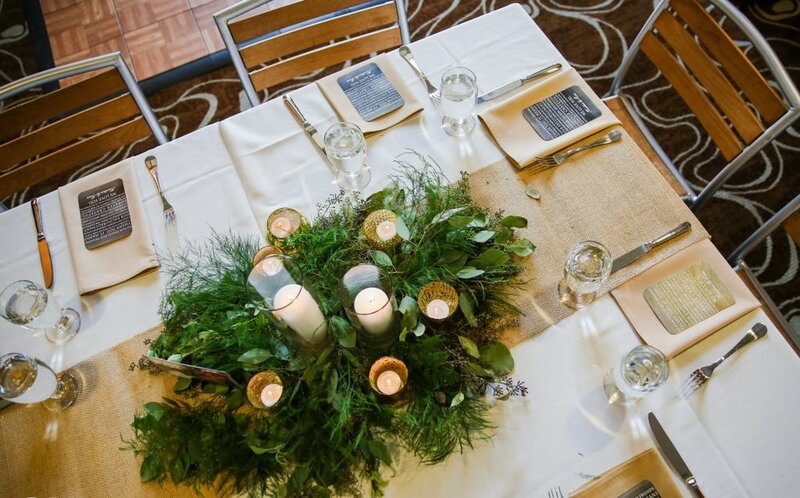 If it's a fully formal event, a sit-down meal with courses is absolutely appropriate. But if you want people up and moving, the best wedding food ideas will be based on mobility and ease of eating. Serve dishes inspired by YOU! What's the first meal the happy couple shared together? What's that one home-cooked meal you attempted to make from scratch that failed miserably? Recreate it (without the faults, of course), and share a special moment with your guests. Imagine how your food looks, too. Taste is definitely important, but Insta-worthy and Pinterest board perfection will make your wedding food ideas all the more magical. Choose a caterer with some creativity and imagination. Taco Bar for after-dancing late night snacks; make-your-own s'mores station for a sweet treat; pumpkin soup first course served in an actual mini pumpkin! The possibilities here are absolutely endless. Creating an appealing wedding reception menu with wedding food ideas that will rock your guests' worlds isn't an easy task, but it's certainly not impossible! We do hope that with our tips and suggestions your task is a little easier, though. Share your menu planning thoughts, ideas, or questions with us and other brides and grooms by reaching out using the social media buttons below!